Just how important is vitamin C? Research shows vitamin C has antioxidant, immune-boosting, and recovery-enhancing properties you just can't ignore! While all vitamins and minerals are incredibly important for normal body function, few stand out quite as much as vitamin C. This vitamin has a variety of properties, which makes it important not only from a health perspective, but also from an athletic perspective. 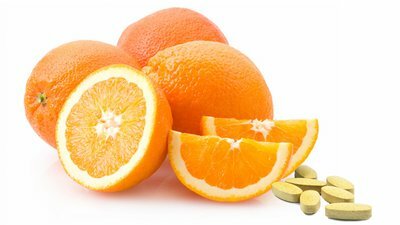 While vitamin C has earned a reputation as a powerhouse antioxidant, it is also critically important in the healthy functioning of immune cells, which is why you see so many vitamin C supplements at your local pharmacy. Vitamin C, also known as L-ascorbic acid or ascorbate, is a weak sugar acid, and is structurally similar to glucose. It was historically used in the treatment and prevention of scurvy, which is a disease caused by vitamin C deficiency. When you think of vitamin C you probably think of orange juice, because the best way to get your daily dose is by consuming any kind of citrus fruit such as limes, lemons, and oranges. Although the whole-food version is often preferable because it includes the fiber of the fruit, the isolated supplemental form of the nutrient has also been studied extensively and has plenty to offer. Why Should I Use Vitamin C? Inside the body, vitamin C plays a variety of functions in almost every system. Most of these processes are related to vitamin C's antioxidant effects. As an antioxidant, vitamin C plays a role in the scavenging of destructive molecules known as "reactive oxygen species" (ROS). ROS are natural byproducts of many metabolic processes, and production of ROS increases during activities like intense exercise or periods of prolonged stress. As the name implies, ROS are extremely reactive with pretty much anything they can get their hands on: cell membranes, proteins, you name it. While ROS are a normal part of the metabolic process, they can also be extremely damaging if their levels are allowed to run amok, increasing the body's demand for antioxidants. Supplementation with vitamin C can provide the body with antioxidants to help neutralize these molecules and keep them at healthy levels. What Are the Available Forms of Vitamin C? While the most commonly available form of vitamin C in most supplements is L-ascorbic acid, in the body vitamin C quickly oxidizes into ascorbate, which is the form that is most physiologically active. This tends to occur in acidic environments such as the stomach. Preventing vitamin C deficiency is important for the body, and is incredibly easy to do. On top of all the foods rich in vitamin C, like citrus fruits, potatoes, cabbage, and cauliflower, many prepared foods are now also fortified with vitamin C to help provide you with even more of this essential vitamin. The research suggests vitamin C can provide a variety of important health benefits, including supporting the immune system, antioxidant properties, and restoration of depleted levels caused from exercise-induced stress. Although using high doses of vitamin C cannot prevent the common cold, "super-loading" with high doses such as 2-3 grams per day of vitamin C has been studied, and some researchers believe it may reduce the total time you are sick. Present in high quantities in immune cells, the nutrient vitamin C is thought to play a role in supporting the production and release of cytokines, as well as improving the efficiency of monocytes getting where they need to be in the body. However, when sickness occurs, these stores are depleted rapidly, which is why vitamin C is frequently included in things such as cough drops and cold remedies. Additionally, vitamin C is a cofactor for several enzymes, meaning the reaction can't proceed effectively if the vitamin is not present. This includes things such as reactions related to collagen synthesis, the shuttling of fat into the mitochondria for ATP production, and the synthesis of certain neurotransmitters like norepinephrine. Due to its protective and antioxidant effects, there is evidence vitamin C can reduce muscle soreness from exercise. Two studies have confirmed this, utilizing a minimum of 1 gram per day of vitamin C as a standalone supplement to test its effects. [6,7] The majority of studies reporting no benefit have used either much lower dosages or have been used in conjunction with other supplements, which may interact to reduce the effectiveness of vitamin C, and could explain why these effects have not been previously reported. If you want to be doubly sure to hit your RDA of vitamin C, you can always boost your intake with a multivitamin supplement, or you can select a standalone vitamin C supplement if you prefer a higher dosage. Are There Side Effects of Vitamin C? Because water-soluble vitamins like vitamin C don't tend to enter into long-term storage like the fat-soluble vitamins (A, D, E, K), any excess consumption tends to be excreted from the body in urine. This is why concentrations of vitamin C and other water-soluble vitamins are rarely able to build up to toxic levels. Previous research has reported that the most common side effects of excessive consumption of vitamin C include diarrhea and a slightly enhanced risk of dental erosion. Several studies have reported no side effects whatsoever, even when individuals consume amounts over a normal dosage. However, it is always recommended that a consumer follows the RDA for vitamin C.
Supplementation with vitamin C may also increase the absorption rates and availability of minerals such as iron and zinc. With iron, an important consideration is that it must be free iron, not bound by a heme group. That means that it shouldn't come from a meat product. Another reason to look into a solid multivitamin! The recommended daily allowance (RDA) of 90 milligrams of vitamin C per day for men and 75 milligrams per day for women is easily achievable through diet. The foods highest in vitamin C tend to be citrus fruits such as oranges and grapefruits, although other foods such as kale also contain an appreciable amount of vitamin C.
However, for exercise benefits, dosages may need to be a little higher. Usually, the easiest way to increase vitamin C intake is with the use of a complete multivitamin or a standalone vitamin C supplement. Due to the role of vitamin C in proper immune function, supplements really do come in all shapes and sizes, including tablets, chewables, pure vitamin C supplements, drink mixes, and even vitamin C-infused cough drops. While vitamin C definitely isn't a one-shot cure all, making sure you're getting an adequate amount can help support the immune system and reduce muscle damage, both of which help maintain health and performance over the long haul. More healthy days and strong workouts are always a win! Davey, M. W., Montagu, M. V., Inzé, D., Sanmartin, M., Kanellis, A., Smirnoff, N., ... & Fletcher, J. (2000). Plant L‐ascorbic acid: chemistry, function, metabolism, bioavailability and effects of processing. Journal of the Science of Food and Agriculture, 80(7), 825-860. Alessio, H. M., Hagerman, A. E., Fulkerson, B. K., Ambrose, J. E. S. S. I. C. A., Rice, R. E., & Wiley, R. L. (2000). Generation of reactive oxygen species after exhaustive aerobic and isometric exercise. Medicine and Science in Sports and Exercise, 32(9), 1576-1581. Bendich, A., & Langseth, L. (1995). The health effects of vitamin C supplementation: a review. Journal of the American College of Nutrition, 14(2), 124-136. Douglas, R. M., & Hemilä, H. (2005). Vitamin C for preventing and treating the common cold. PLoS Medicine, 2(6), e168. Bryer, S. C., & Goldfarb, A. H. (2006). Effect of high dose vitamin C supplementation on muscle soreness, damage, function, and oxidative stress to eccentric exercise. International Journal of Sport Nutrition and Exercise Metabolism, 16(3), 270-280. Nakhostin-Roohi, B., Babaei, P., Rahmani-Nia, F., & Bohlooli, S. (2008). Effect of vitamin C supplementation on lipid peroxidation, muscle damage and inflammation after 30-min exercise at 75% VO^ sub 2max^. Journal of Sports Medicine and Physical Fitness, 48(2), 217. Li, H., Zou, Y., & Ding, G. (2012). Dietary factors associated with dental erosion: a meta-analysis. PloS One, 7(8), e42626. Moertel, C. G., Fleming, T. R., Creagan, E. T., Rubin, J., O'Connell, M. J., & Ames, M. M. (1985). High-dose vitamin C versus placebo in the treatment of patients with advanced cancer who have had no prior chemotherapy: a randomized double-blind comparison. New England Journal of Medicine, 312(3), 137-141. Bruno, R. S., Leonard, S. W., Atkinson, J., Montine, T. J., Ramakrishnan, R., Bray, T. M., & Traber, M. G. (2006). Faster plasma vitamin E disappearance in smokers is normalized by vitamin C supplementation. Free Radical Biology and Medicine, 40(4), 689-697. .
Huang, J., & May, J. M. (2003). Ascorbic acid spares α-tocopherol and prevents lipid peroxidation in cultured H4IIE liver cells. Molecular and Cellular Biochemistry, 247(1), 171-176. Kalgaonkar, S., & Lönnerdal, B. (2008). Effects of dietary factors on iron uptake from ferritin by Caco-2 cells. The Journal of Nutritional Biochemistry, 19(1), 33-39.